My husband and I decided to get rid of our cable (well, we had satellite, but I always just call it cable). We just did not watch TV that often, and honestly we weren’t all that pleased with what was available. When we realized we were paying nearly $100 per month for a service we didn’t really use….well, we couldn’t get rid of it fast enough! Now, we still have a television, just no television service. So, we can still play video games and watch DVDs. We went several months with just watching movies or the occasional show on Hulu (which is free) or Amazon Instant Video. We also made the decision to sign up for Netflix. For only $8.99 per month we can watch unlimited movies and television episodes through our XBox, Blu-ray player, or computer. This is a much better deal for us with about 90% savings! We really enjoy using Netflix – we don’t have to deal with commercials, we save a ton of money, and there are even some great shows available that will benefit our homeschooling adventure! *2015 UPDATE – Now, five years later, we still don’t miss cable AT ALL!! Between Netflix and Amazon Prime we can watch all of our favorite shows and we save a ton of money! 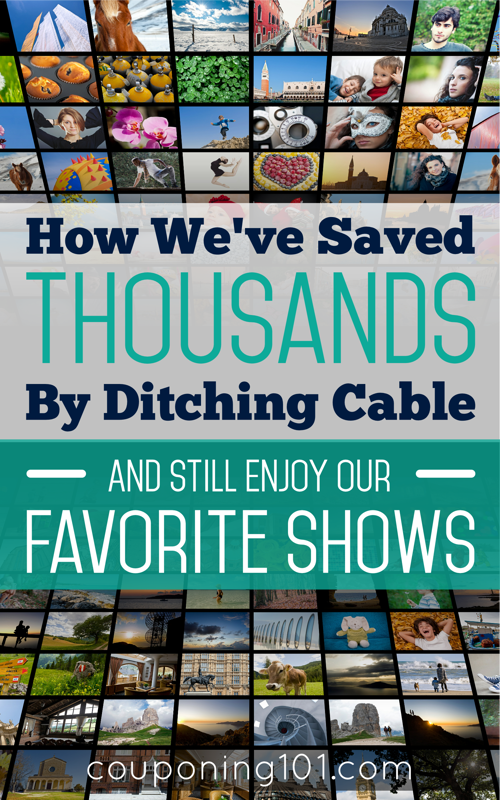 We’ve actually saved thousands of dollars over the past five years just by ditching cable! Now, that is pretty significant savings! I’d love to be able to do this but hubby watches MLB only, and as hard as he works, I can’t see taking that away from him. I wish there was an option that didn’t cost $70 a month just for the sports. I use a Mohu Leaf antenna for local TV, Netflix and Hulu Plus. So happy to get rid of cable! We do the Netflix and Hulu and just have a home phone and internet for $60 a month. So we are averaging a good price. We use the clear antennas for local tv and get many great channels. We’re news junkies in my house – does netflix offer news or should we look to our computer for that? All of you have gr8 ideas! Netflix doesn’t offer live news channels. I would look to the computer for that one, or get an antenna for the TV to pick up basic local channels. My cable is bundled up with my internet. There’s another option I have for internet, but it’s pretty slow. Do i need good internet connection for netflix? @shawn, I would have to say yes. If you watch them via the computer or game console then you need fast internet. If you just watch them on DVD then you don’t really need fast internet. Honestly, I’ve only ever had cable for a couple of trial months in my lifetime, and I feel like it’s a big waste of money that too many families treat as a necessity. And believe me, I love watching TV! We have the digital antenna and converter box (we still have old school TVs) and utilize the free streaming that the networks have on their websites for the most popular shows. We rent from Redbox maybe once a month. Much better than paying a monthly fee for TV! @Shelly, I absolutely agree – tv is not a necessity! However, I do enjoy it on occasion and I’m so glad to be paying so much less for it now! I appreciate the info you have provided. My wife and I have been contemplating getting rid of our satellite for a few months now but were unsure about the other options. @John, I think Netflix is a great alternative and we definitely don’t miss cable! @Stephanie, One other question – How many television shows does Netflix carry? It didn’t seem like a lot, but I wasn’t sure. @John, There are a TON! Quite a few currently popular shows available too that I did not expect to see. We just recently did something similar. I’m really into Grey’s Anatomy and Desperate Housewives so there was no way I was getting rid of ALL of our “cable” channels. I dropped our digital service and opted for the “limited” basic my company offers…but do not advertise. Normally the cable company offers basic cable of about 70 channels or so, but most companies also offer a limited basic which is only 12 dollars a month in my area for channels 2-25. This enables me to watch the shows I love as they come on and saves us about 95 dollars a month. I also have Netflix and a Wii, so we get the benefits from that too 🙂 We spend a total of less than 25 a month and always have entertainment. @Jena, Awesome! Cable companies are so sneaky….it pays to be willing to look for ways to save money! We haven’t had cable (or satellite) or satellite for several years, since we just don’t watch enough TV to justify the expense. We get great broadcast TV reception with our digital antenna (for the few shows we do watch), and we have Netflix to supplement for movie night. The only thing that we missed by not having cable was all the football games that were only aired on ESPN…but we found out last year that we get ESPN360 for free on our computers, since we have our internet through AT&T UVerse. Problem solved! @Corrie @ “Cents”able Momma, Hey, I didn’t know that about ESPN and Uverse! Thanks for the info! We have been withot cable for a long time, we have the HD antenna. One of my daughters is highly allergic to mosquitos so over the summer we got cable. I was excited but most of the cartoons are very inappropriate for my children. We still have the cable but just watch PBS through our antenna since it is in HD. I am stuck in a 2 year contract now!!! I knew we shouldn’t have done that, is there anyway out of it? @Jessica, I actually cancelled our contract early. We had to pay a fee, but the fee was less than paying for several more months of service for something we weren’t using. Yes I have Netflix, I also been using Redbox because of the Free Dvd/ WYB 2 Pepsi deal. But Netflix is awesome, Ive been with them two years and its so easy to watch the movies instantly. @Jeremy, I was renting a lot of Redbox too! lol. And I’m soooo loving the instant movie watching with Netflix! @Jeremy, Great tip to save money. I love it too. But only the DVD part of Netflix truly has a selection. If you’re really a film fan you have to pay $2 more a month to get the DVDs in addition to the streaming or else all old films are a no go. LOVE your site! It’s worth the (small) investement to get a digital antenna. You can get all the free local channels, and the picture is crystal clear, not like the old bunny ears. Also, no adjusting said bunny ears or having to look at them on top of your TV. Our antenna is flat, and about the size and shape of a small book. In our area, we get the 5 basic chanels, plus a few extras. @Siobhan, That is a good idea too!